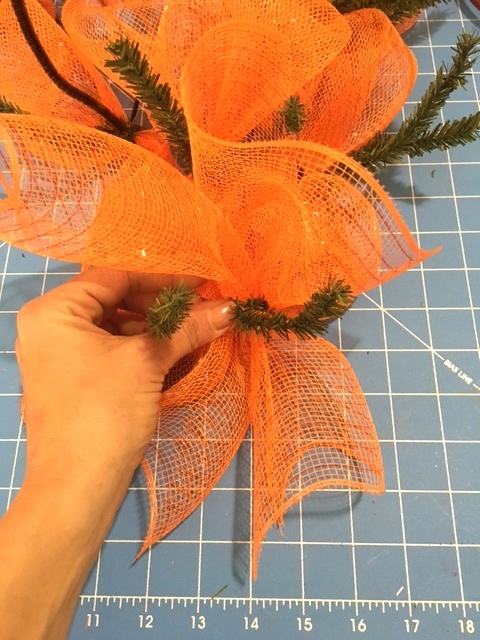 To start your carrot, turn the tree form upside down so it looks more like a carrot. Spread open pencil ties. 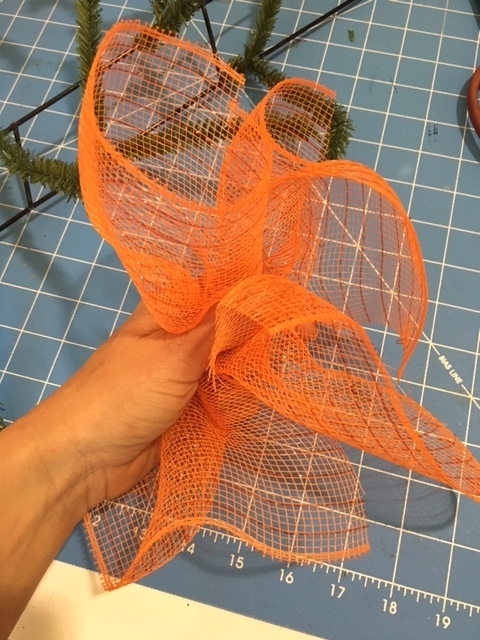 Tie the end of the orange deco mesh into the ties at the bottom point of the carrot to start it, leaving a few inches to tuck away. Twist the ties tightly so the mesh will not come loose. 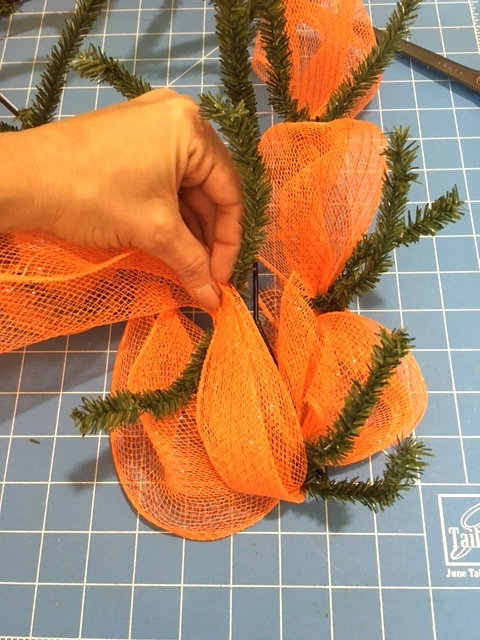 When you come to the "top" of the carrot, keep going straight across the top, skipping the "trunk" of the tree. 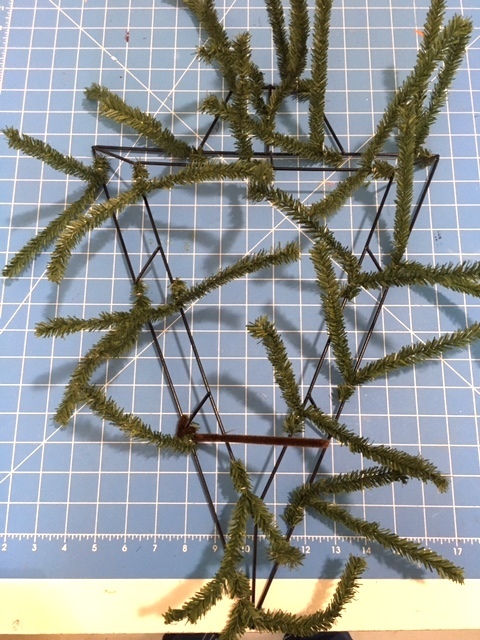 Do not attach the mesh to the very top two ties. 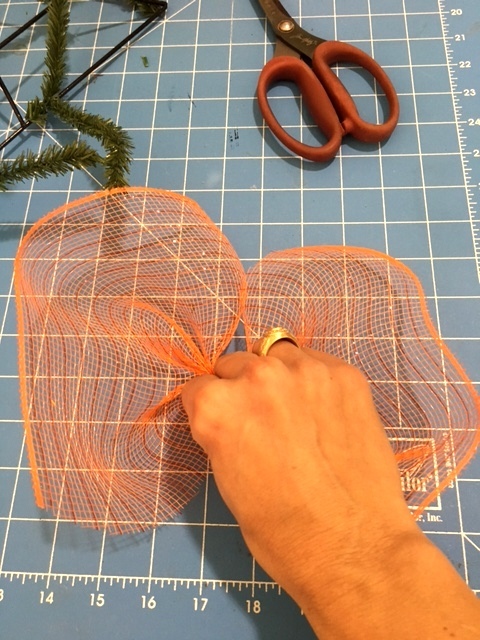 As you finish the outer ring of the frame, tie the mesh back into the first set of ties again to complete that ring, and run it up to the closest set of ties on the inner ring, and twist it in to start lining the inner ring. Continue around the entire inner ring, just as you did the outer. 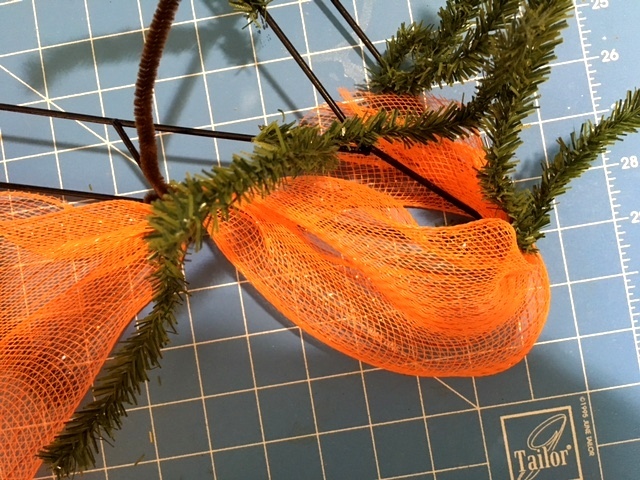 Once done, cut off the mesh, leaving a tail that is a few inches long so and tuck it away. This is what your "carrot" will look like at this point, when you are done lining the frame. Now to work on the ruffles! 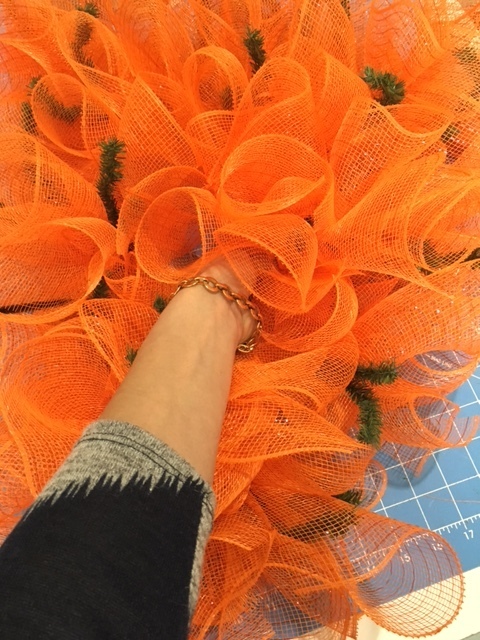 Cut the rest of your roll of orange mesh into 10" squares. You will also need to use some of the second roll, but you can cut it later as needed. Scrunch the middle of the square, starting at the middle of the top edge, scrunching down to the bottom as you go, so that it looks ruffled like the picture above. 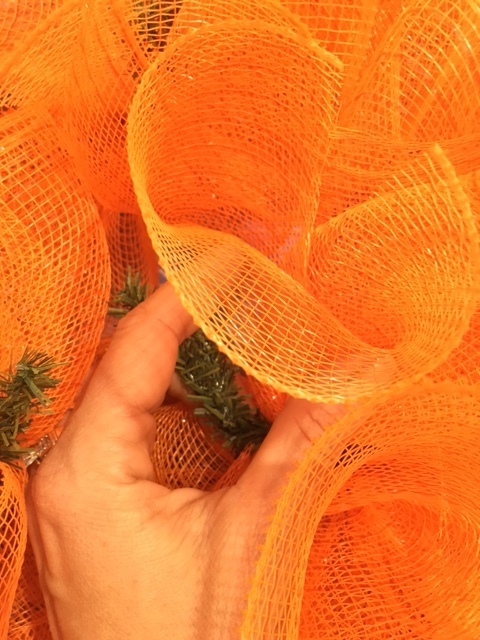 While holding the ruffled mesh in one hand, scrunch and ruffle a second square. Tie them both together, at the middle of the pieces, into one set of ties on the carrot. You can start anywhere, as long as it is not the top where the "trunk" is. I started at the carrot tip again. Keep doing this until you have filled in every set of ties besides the trunk. I ended up going back after I finished, and added more in here and there to help fill it out, so you may even want to just tie three pieces into each tie to start with. Once you have your carrot filled in, I like to go ahead and hide all the pencil ties away. 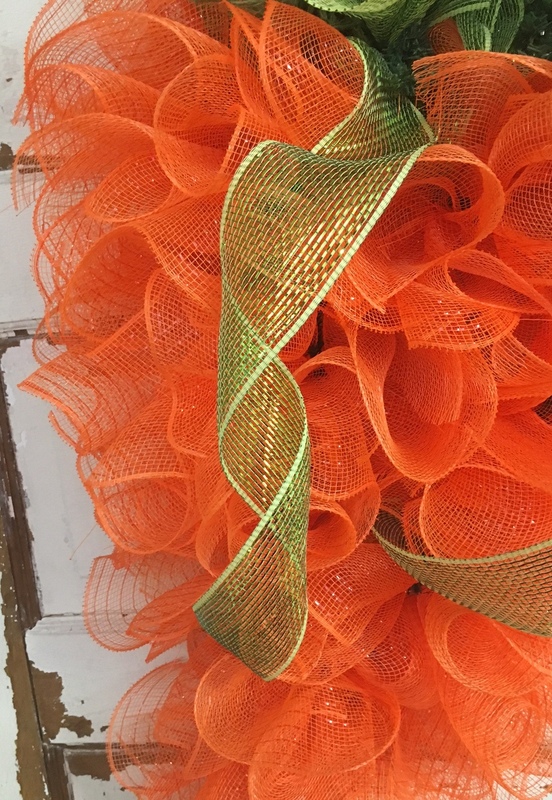 You can either do this now, or once the entire wreath is complete. 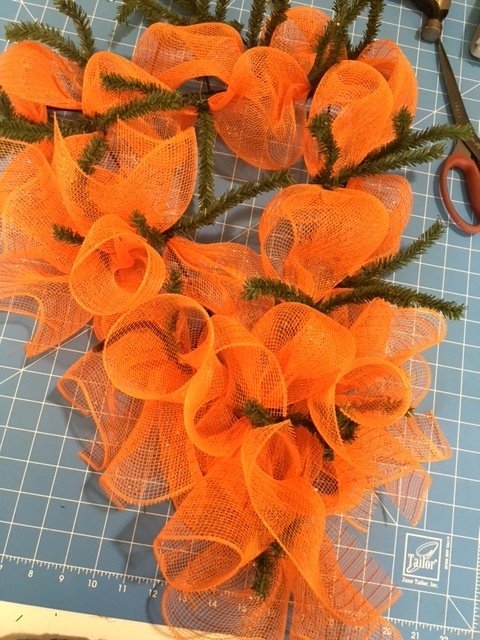 Grab a set of ties and push them through your wreath to the back, and wrap around the metal frame to tie them down and hide. Do this for each set of ties, leaving the top row near the trunk alone. Now, we'll work on the greenery at the top of the carrot. 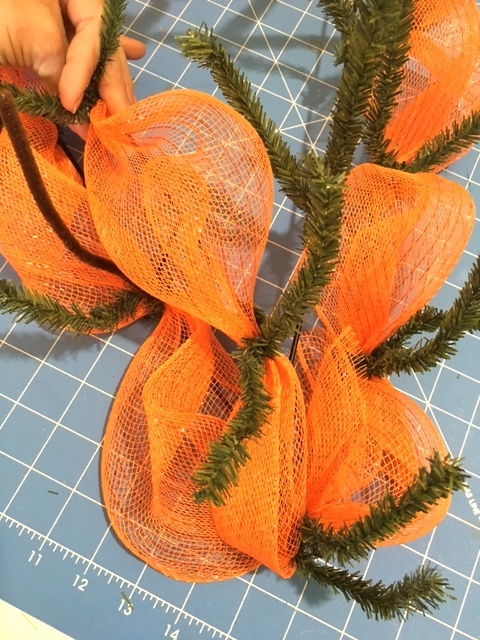 Cut a few 10" squares of fern green open netting and 10" moss/apple green mesh. 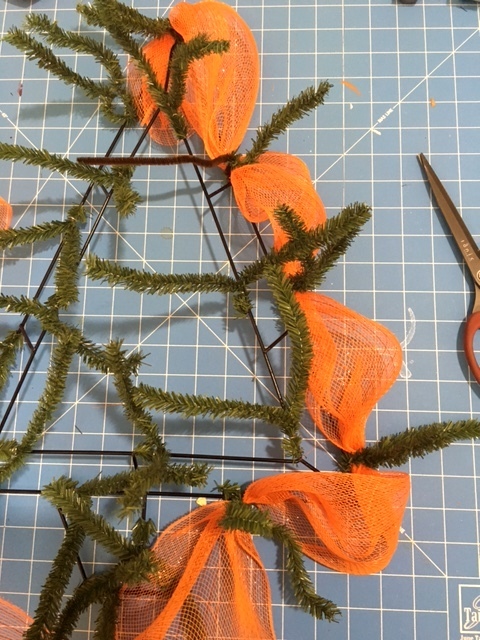 Roll the squares so that the "finished" edges are on either end of the roll, and tie them into the "trunk" and along the top row of the carrot, where you already have the orange mesh tied in. (Just untie the pencil ties, add in the new pieces, and re-tie.) Add the pieces to your liking. I always play with mine, adding them, and readjusting where needed. 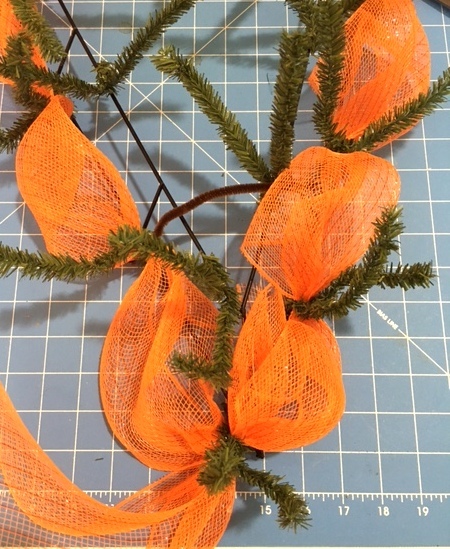 Finally, cut two strips of 2.5" moss/apple green mesh ribbon, about 26" long each. Tie one end of each into the top row of the carrot again, one on either side, and twist it loosely a couple times to give it the curls. 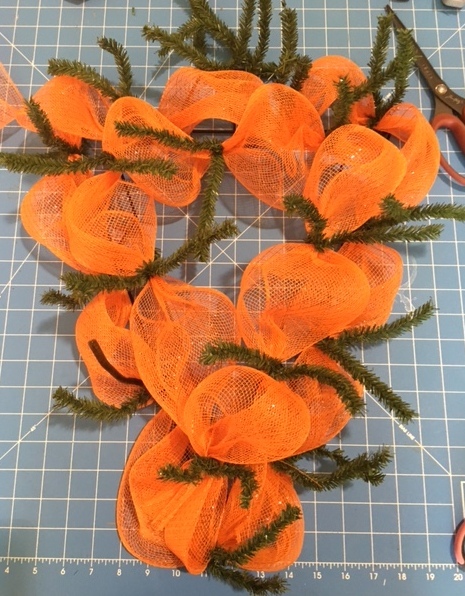 Tuck the ends down into and through the orange mesh. The rough ends will "grab" onto each other and hold it there. You also have lots of freedom here with your greenery. 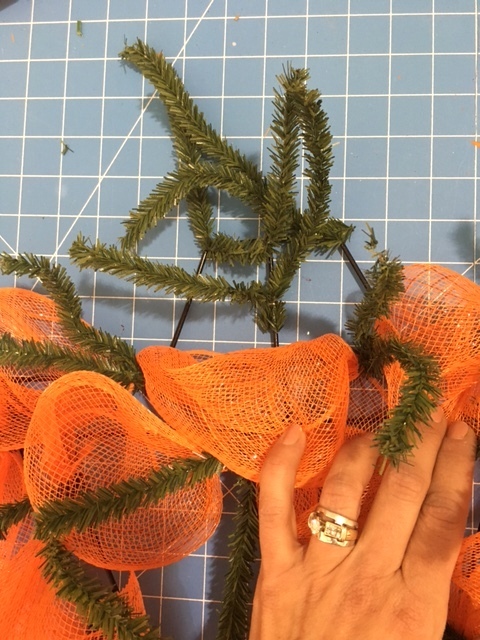 You can use different shades of green mesh, longer lengths (21") if you prefer, or completely different materials, such as burlap, or even actual faux greenery. This tutorial should at least give you a starting place for you to build your own creation. Have fun creating!